I am a morning person and always have been. The morning is definitely my most productive and favorite part of the day. I hop out of bed and am ready to go first thing in the morning. 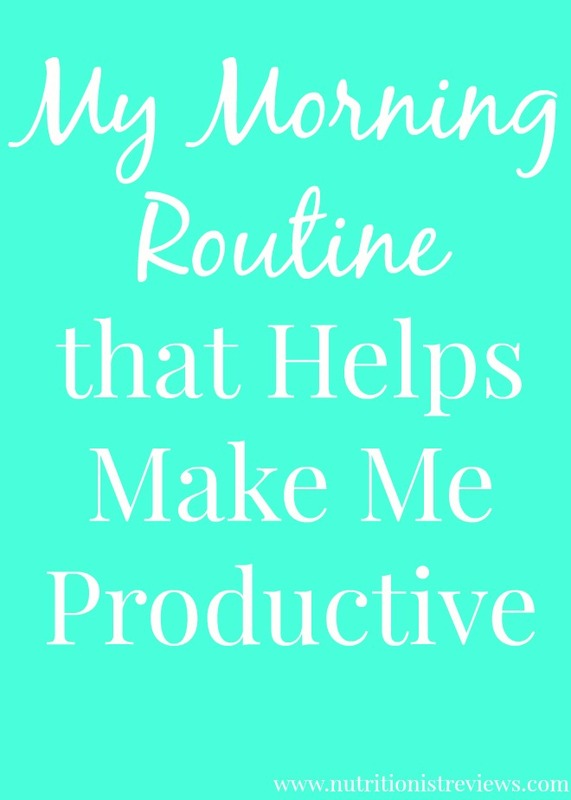 I know that a lot of people are not morning people (including my husband) so if you are trying to become more of a morning person, I want to share my tips and tricks for a productive morning routine that gets you energized and ready for the day. I like to live life boldly and this morning routine is what works for me. 5:30-6:15 AM- Wake up- I do not use an alarm clock. Either my 2 mini dachshunds who sleep in bed with us wake me up, my husband's phone alarm if it is a school day or my almost 2 year old daughter often wakes me up. A lot of times though, I will just get up on my own. Right when I get up, I let the dogs out and feed them. Meanwhile, I go to the bathroom and throw on my workout clothes if I am not already wearing them from the night before. I like to sometimes sleep in my workout gear if it is comfortable so I can get up and go right away in the morning and not make too much noise if my husband and daughter are sleeping. ~6-7 AM- First thing in the morning is when I like to get my exercise in for the day. In the colder months, I will walk on the treadmill while answering emails and working on my treadmill desk that Troy built me. This is the time that I will promote my post for the day, submit it and share on social media. When it is nicer out, I take my trusty personal trainer, my 11 pound dachshund Jaxen for a walk with me. We usually go 2-3 miles. If I am feeling motivated (which is not often enough), I will lift some weights and do a little ab workout. I am constantly trying to get motivated to do other exercise besides walking and it is a struggle for me. 7-7:15 AM- Assuming it is a work day, I now need to hustle in order to get to work on time. I either sneak in a shower or sometimes, I shower the night before. I have my clothes already laid out for the week on my dresser to make getting dressed super easy in the morning. My lunch is also already packed from the night before. I often bring leftovers from the night before such as my Quinoa Bell Pepper Pilaf. I brush my teeth, swish my mouth with some LISTERINE® Antiseptic in the Cool Mint flavor which I pick up from CVS. That strong mint flavor gives me a little extra pep in my step to get my day started. It kills 99.9% of bad breath germs which I love. Dental health is very important to me and LISTERINE® helps to prevent cavities, strengthens teeth and cleans the whole mouth. I wear minimal makeup everyday. I usually just put on bronzer and sometimes mascara. Yes, that's it! I am not too fussy when it comes to getting ready. I can get ready in 5-10 minutes. 7:15 AM- Wake up Adalyn- With it being the summer right now, Troy is home with Adalyn all day because he is a teacher and is out for the summer but if it was during the school year, we would be getting her up and driving her to my mom's house or Troy's moms when we both go to work. I love getting her up in the morning and giving her a huge hug and kiss everyday. It is such a sweet moment between my baby girl and I. Troy and I love sneaking in there and watching her sleep if she doesn't wake up first. 7:20 AM- Grab my lunch and leave the house- We cage our dogs for the day and go to work. I usually eat my breakfast on the way to work if I know that it is going to be a busy day. I usually have oatmeal with chia seeds, flax and peanut powder topped with some kind of nut butter. If I do not feel like that, I will have Greek yogurt. ~7:30 AM- Arrive to work and work, work, work, work, work all morning long! During my lunch break, I will either work on writing posts, run errands for the blog or go on a walk around my work. I love this time to break up my work day. I work till about 3:00 each day and then go hang out with my family! To learn more about bold moments, check out LISTERINE®.